Turning to the rodents: Gophers on up to 'chucks, I'm still not convinced that the heavy-barreled centerfire is the across-the-board choice. In fact, I'm convinced it's not, because not all ground squirrel, prairie dog or woodchuck hunting takes the classic form of setting up for the long shot. In California a lot of our best ground squirrel hunting takes place in small valleys, where long shots are uncommon. In the Rocky Mountain West some of the most fun I've had is wandering irrigated hayfields and shooting at the thousands of gophers that infest them. In hilly, small woodlot country throughout the East there are stalking opportunities for woodchucks in places where there's no way to set up for a long shot. 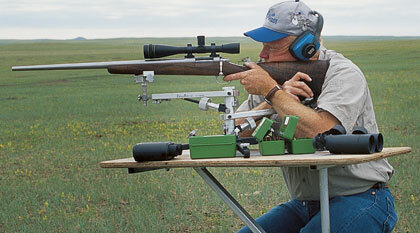 The 6mms are also popular and extremely effective long-range varminters. The .243 Winchester is the most popular by a huge margin, offering (like the .22-250) a tremendous variety of loads, bullet weights and styles and a rich history of loading data, but there are faster 6mms, including the old 6mm Remington and the new .243 WSSM. The heavier 6mm bullet does better in the wind than any .20 or .22, so it is preferred by a lot of Western varminters who haul out their "big" 6mm (and in some cases .25) when the wind gets strong and the range gets long.